As a preeminent modern virtuoso, U.K. guitar master Guthrie Govan dazzles all who hear his playing. Charvel spent two years of meticulous development with Govan to first introduce his Guthrie Govan signature model in 2014, and it’s the ultimate ultra-pro guitar. Loaded with special features and high-performance appointments, it's truly the ideal expression of Govan's artistry rendered in distinctive Charvel form. For 2017, Charvel is offering new incarnations of Govan’s signature model, including the Guthrie Govan USA Signature HSH Flame Maple. This 25.5” scale guitar offers a caramelized basswood San Dimas® body with a gorgeous flame maple top with a thin satin urethane finish and a specially contoured heel (sans neck plate) for easy access to the upper reaches of the fingerboard. The bolt-on neck is two-piece flame maple with a "caramelized" heat and drying treatment that makes it sound and feel much older, with graphite reinforcement, hand-rubbed urethane gel on the back of the neck and a convenient truss rod adjustment wheel at the body end. Most unusually for a San Dimas model, the compound-radius (12"-16") flame-maple fingerboard spans two octaves, with the same caramelized treatment as the neck, 24 extra jumbo stainless steel frets and special maple dot inlays with ebony borders, as well as Luminlay side-dots that emit light for the darkest of stages. 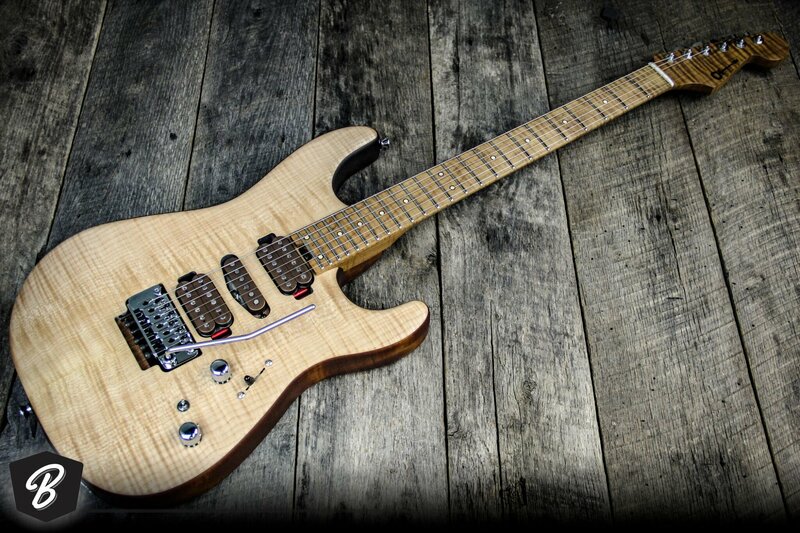 Other premium features include three specially wound Charvel custom MF pickups arranged in a versatile HSH configuration with five-way switching for the expansive tonal openness and dynamic sensitivity that Govan demands, a 2-way mini toggle switch to engage single coil simulation in bridge and neck humbucker position, two Luminlay numbered dome control knobs (master volume, master tone), U.S.-made recessed Charvel locking tremolo bridge with Tremol-No™ unit and oversized brass block, bone nut and chrome hardware.